"Unless you're a stuffed shirt or a prude, you can't help but have a grand old time." The pub opened September 11, 1974. Durty Nelly’s Irish Pub is a replica of the original Durty Nelly’s in Ireland, dating back to 1620, as part of the Bunratty Castle in Limerick, Clare Country. It's been part of the landscape at Bunratty for almost 400 years, and today continues to be the "favourite ‘watering hole’ of both locals and visitors alike." 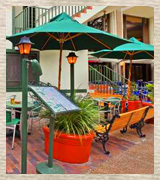 The concept of the San Antonio location came from Bill Hunter, general manager of Hilton Palacio del Rio in the 1970’s. After visiting the bar in Ireland, he returned to the Alamo City to convince Bartell Zachry (previous CEO of Zachry Construction Company and builder/owner of Hilton Palacio del Rio) to build an identical pub on a seldom used corner of the hotel. The pub is designed in the tradition of the European style with two fireplaces, slate floors and stone walls, and from the time its doors first opened to present day, this corner is a hot spot on the San Antonio River Walk. The rules at Durty Nelly’s are posted, “only two to a stool, no talk of religion or politics and those drinking rum may stand by themselves, preferably near the window.” And no wee ones under 21 allowed after 7 pm. Enjoy a pint and some peanuts while singing along with world-class piano entertainment. Durty Nelly’s may be the closest thing to a genuine Irish experience anywhere on the River Walk in San Antonio. See you soon. Slàinte! Copyright 2019. Durty Nelly's. Web Design by Giles-Parscale Inc.